Orgran Rice & Corn Pasta is a high quality multi award winning pasta carefully produced from a combination of rice and sun ripened corn. It is naturally wheat and gluten free and is also a delicious, versatile product that provides diverse nutrition over wheat pasta. 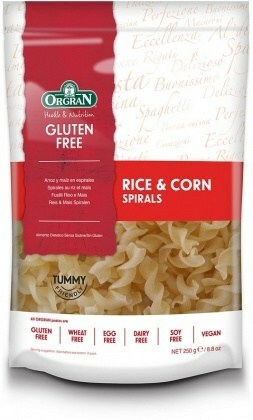 Available in Spirals, Penne, Tortelli, Macaroni, Lasagne, Noodles and Risoni (Garlic & Herb flavoured) varieties.